Welcome to Bonners Piano Centre - a showcase for premium quality pianos of all types situated in Reigate, Surrey - just two miles from Junction 8 of the M25 London orbital motorway. Bonners Music, which has been supplying the UK with premium quality musical instruments since 1976, took over the premises of Piano Workshop in Reigate 3rd October 2016. We’re really excited about the new showroom, and are looking forward to working with the Piano Workshop’s existing team, who are going to bring so much to the Bonners family. Our new Reigate piano shop will give customers from London, Surrey and Sussex the chance to try before they buy in an easy to reach location. Visitors to our piano shop are able to get expert advice from accomplished musicians who are really passionate about what they do. Choose from the widest selection of new, used, acoustic and digital pianos in the south, across all price ranges. Bonners Piano Centre is the ultimate destination for piano customers. Our new showroom covers 4,500sq ft. and is home to over 70 pianos, ranging from compact upright pianos to full-size grands. We cover everything from traditional acoustic and digital pianos, through to the very latest in modern piano technology such as the groundbreaking Yamaha Disklavier, TransAcoustic and Silent pianos. Our specialists make sure all our customers get the chance to compare all the major brands under one roof, and make the right choice before they buy. We believe it’s absolutely vital to get expert advice when you’re investing in an instrument that will be a part of your life for years to come. When choosing a piano for yourself or your family, it is vital that you are given all the information and choice you need to make the very best decision. 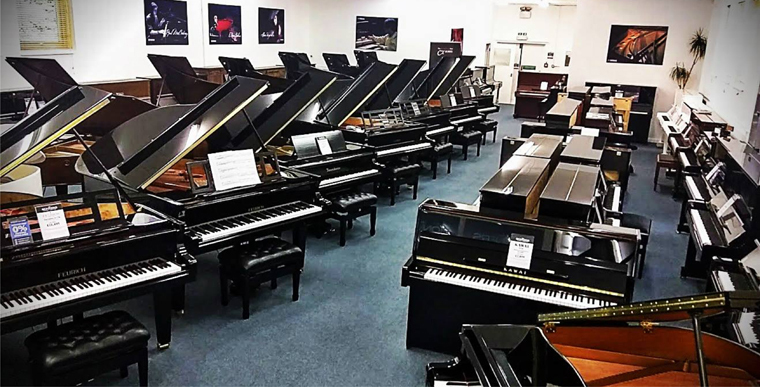 Bonners Piano Centre is one of the only places in the UK where you can compare so many brands under one roof including acoustic and digital pianos side-by-side. You can also see a wide range of reconditioned and second hand pianos in our Surrey Piano Shop. Bonners offer part exchange deals and finance options to make it easier to buy. Our in-house workshop facilities to repair anything from damaged caseworks to completely rebuilding pianos. Bonners Piano Centre is just two miles from junction 8 of the M25, and is open seven days a week. For more information contact 01737 242174 or visit Bonners Piano Centre at 46b Albert Road North, Reigate, Surrey RH2 9EL. The original Bonners Music Superstore is still located in Langney Road, Eastbourne and offers a huge range of digital pianos, guitars and electronic drums. A comprehensive selection of new, used and restored upright pianos and grand pianos with over 90 pianos currently in stock (see pianos for sale for details). Piano rental: Long term with purchase option.